This is Caledonian Road in north London, more commonly known as The Cally. It's been called the Cally for ever, but they felt it necessary to write it in big bold letters on the railway bridge in case people forgot. 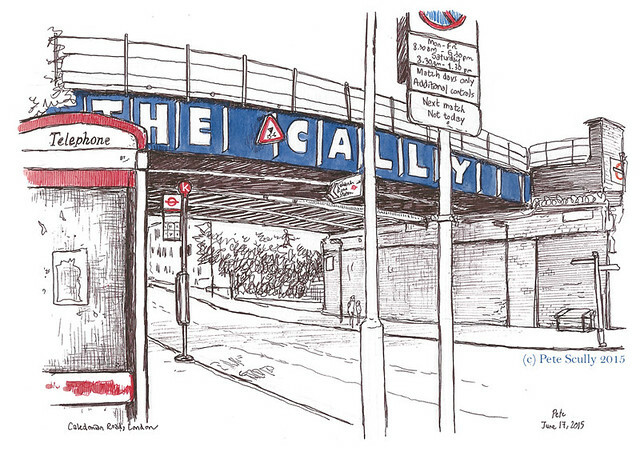 The Cally is not the area of London where I am from (I grew up in Burnt Oak), but this is where my Dad is from. He lived up the road, near the Nag's Head in Holloway. When I was a kid my dad would sometimes drive me over here when he had to visit his mates or one of my uncles, who still live locally. I was always very nervous of this area as a child, a rough place (and my own Burnt Oak was pretty rough) of villains' pubs, broken windows and dangerous alleys. It's still pretty tough, but I can appreciate the character in it now I'm grown up. Actually, I think this would be a very interesting place for a sketchcrawl (though I'd still keep my eyes open). 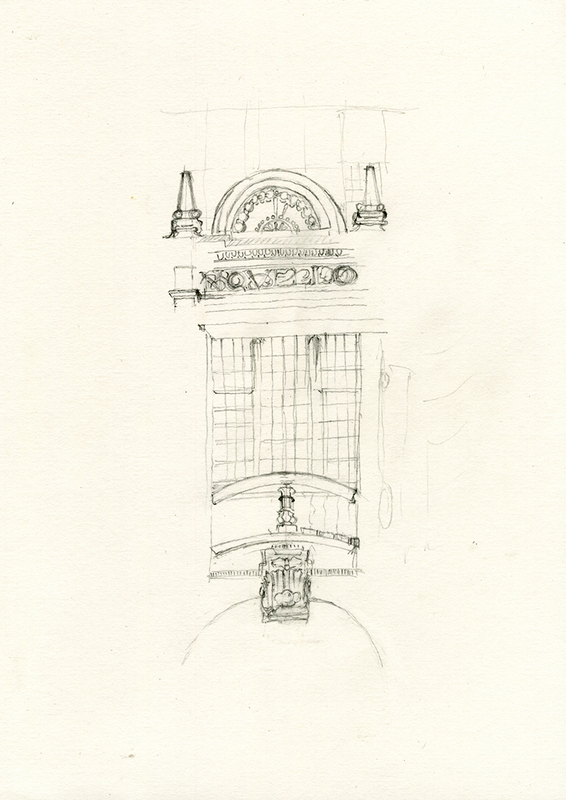 I sketched this area while I was back in London in June. 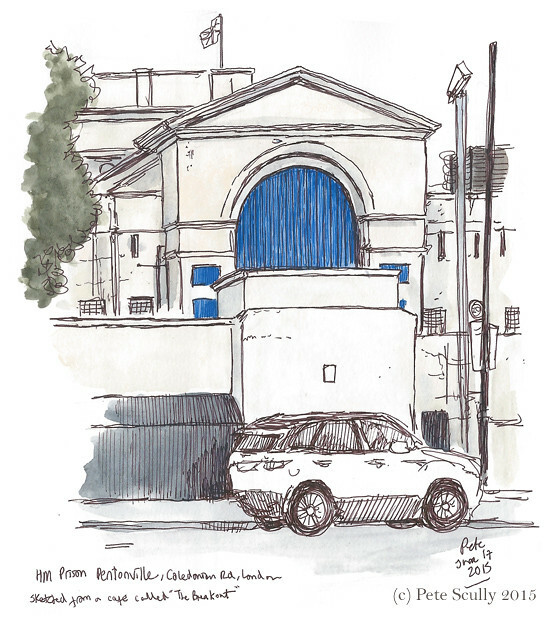 One building I had to sketch was HM Prison Pentonville, the 'big house', which casts a imposing and gloomy shadow over Caledonian Road. Pentonville was opened in 1842 and has had many famous residents, such as Éamon de Valera, Dr. Crippen, John Christie (and Timothy Evans who was wrongly hanged for Christie's crimes), Oscar Wilde, and, um, George Michael. 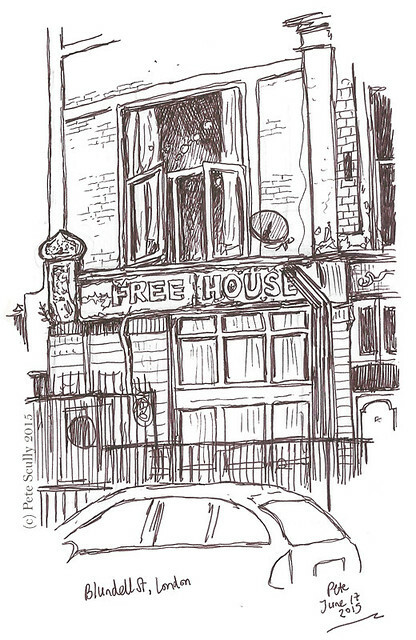 I sketched it from a cafe across the road called, appropriately, the Breakout. Condemned inmates were executed here at Pentonville until 1961. Prisons are horrible places. From the Jail House to the Free House...this is actually at the back of the Breakout cafe, which looks like it was built in the space of a closed-down pub. This is part of the old pub signage around the corner from the Cally on Blundell Street. My dad actually went to school on this street, though the school is long gone. Funny that he grew up round the Cally, while I ended up in Cali(fornia). 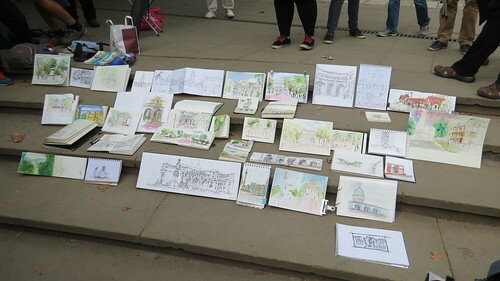 Despite the late change of date we had a really excellent turnout and a very good time during for the August Sketchcrawl of St James Park, HorseGuards and Trafalgar Square. 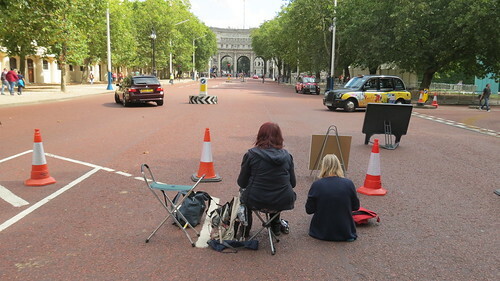 They even closed The Mall to cars so we could sit in the middle of the road and sketch! ON THE MALL road surface - sketching impressive architecture - with perspective! People would keep crossing the road and getting in the way of the view! - who was a little nearer to the Arch. on the Parade Ground at Horse Guards the previous day. The War Memorial is at the back- next to the trees. 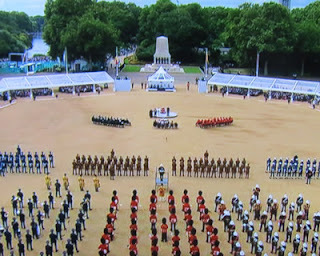 We assembled the day after the 70th anniversary of VJ Day at the WW2 Memorial in Horse Guards opposite the Parade ground. I'd had this in mind for morning sketches but since the structures from the VJ Day Drumhead Service were being removed from the Parade Ground I suggested people came back to this spot in the afternoon - which a number of us did. Hence the large number of sketches of Horse Guards Parade with the London Eye in the background. 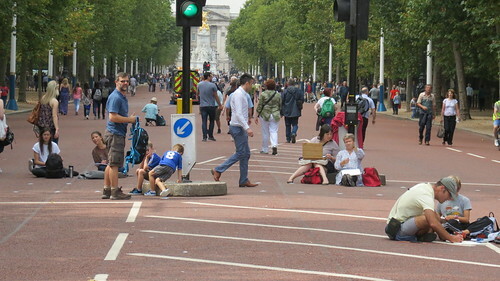 However in the morning the major recommendation was to make the most of the fact that The Mall was 'coned off' and pedestrianised - and to to sketch things from a perspective that normally would not be possible. 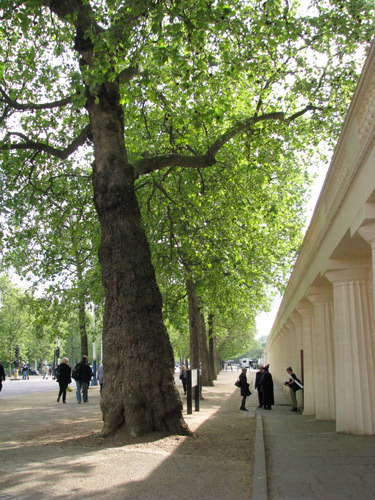 In general people wended their way from Horse Guards to the Mall and then via Admiralty Arch to Trafalgar Square. 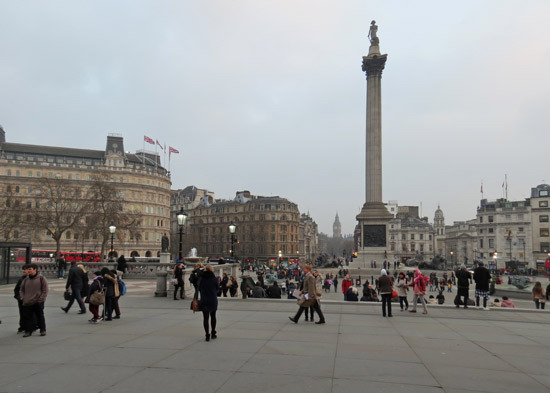 There's masses to sketch and that's good because we are back in Trafalgar square in December for the huge Christmas Tree! The London Eye gets everywhere! Apparently you can get the accordion panoramic sketchbook from Cass Art. 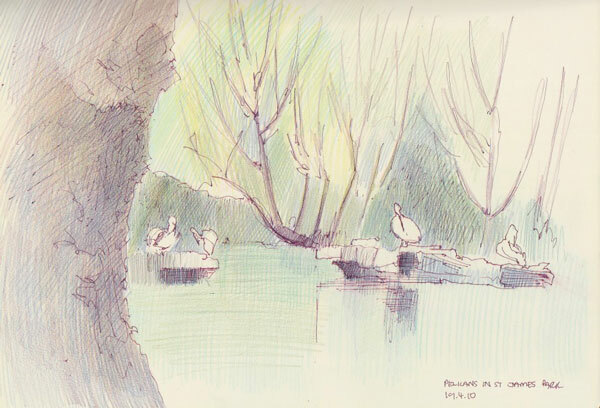 see sketches that have been posted to Flickr in the Urban Sketchers London - Group Pool. Click the photos above to go straight to larger versions on Flickr. Nathan is organising the Sketchcrawl for September. 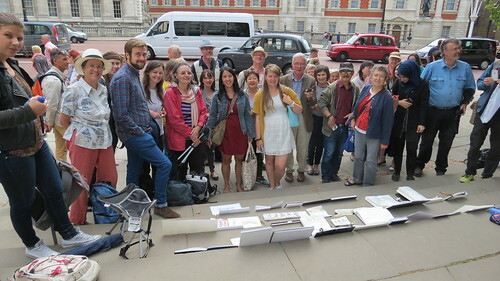 the Urban Sketchers London Facebook Group - Details and dates of forthcoming events can also be found at https://www.facebook.com/notes/urban-sketchers-london/how-to-find-out-about-urban-sketchcrawls-in-london/399571500240608. 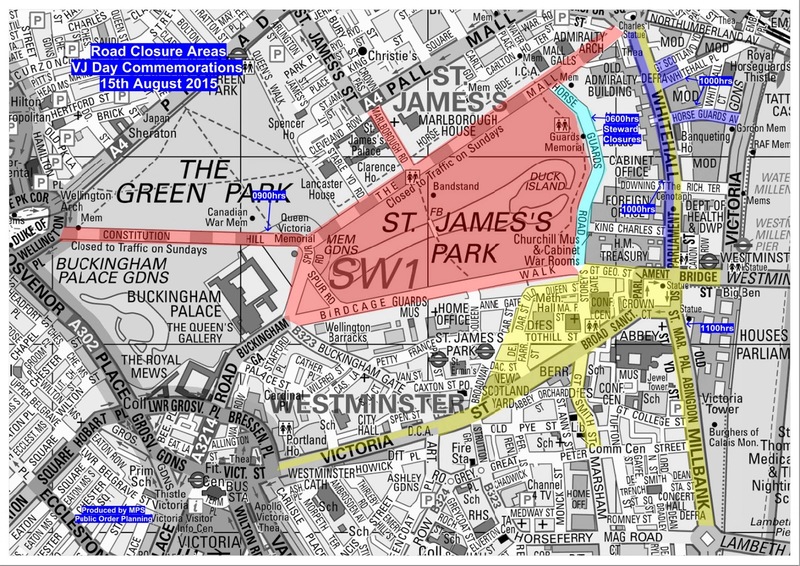 We always do a search to see if there's anything coming up in an area at the time but somehow or other the VJ Day celebrations did not pop up as something happening on that day. It's a big celebration this year because it's the 70th and consequently the last major celebration at which many people who participated in that theatre of the second world war will be able to participate. However the important thing for our sketchcrawl is that it will take place on the same day - and in exactly the same area (see map below). So - we've decided we need to change the date. People were sounded out at short notice via the Facebook Group Event listing and we've decided to change to the Sunday. Profuse apologies to all those who cannot now make it - but we thought a more enjoyable environment and no hassle for backpackers was more important for our sketchcrawl. Anybody who has bought a train ticket should be able to change it or get a refund. For those feeling intrepid and determined to brave the crowds you can find details here of what will be happening re the flypast by three historic service, the drumhead service and big screens. Please also be alert for security considerations. If anybody knows of a listing which identifies events in specific areas by specific dates we'd like to know about it as we did check before deciding on the date! 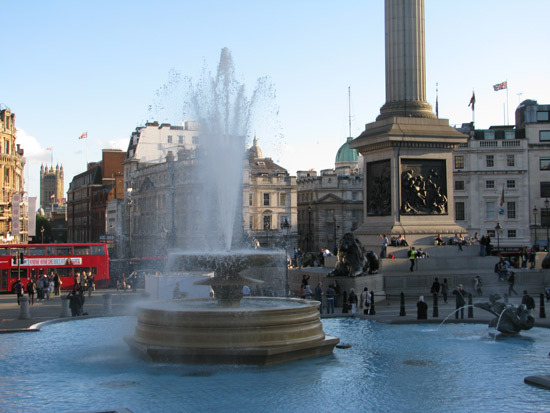 Houses of Parliament, Nelson's Column, Lions and London Buses - plus water features! Our next London Urban Sketchers sketchcrawl will be around and about The Mall, St. James's Park and Trafalgar Square in Central London. It's FREE and there's no need to book a place - just turn up on the day! Details of where to go are listed beneath the images and sketches below. 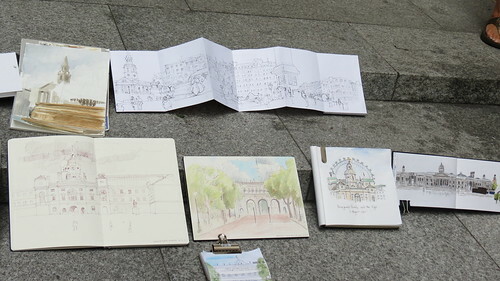 You are spoilt for choice in terms of places to sketch and there's something for everyone. 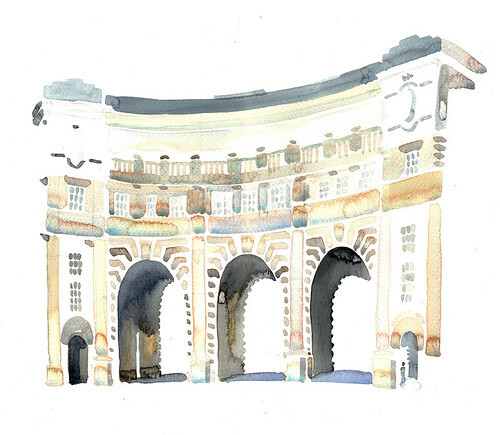 draw the fantastic architecture of Horse Guards (a large grade I listed building in the Palladian style between Whitehall and Horse Guards Parade in London) and Admiralty Arch (another Grade 1 listed building). LUNCH: 1:00 the terrace between the Mall and Spring Gardens (up the steps from the Mall - next to British Council HQ and between Mall Galleries and Admiralty Arch). (Wet Weather: Next to the Gates under Admiralty Arch). 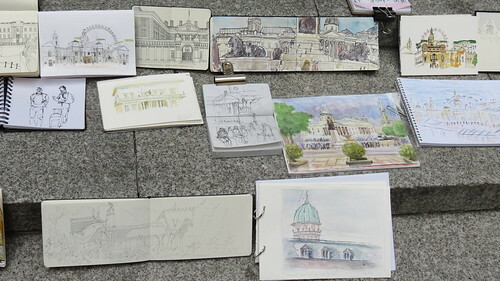 We'll share out sketches and probably do the lunchtime photo on the steps. There's also a couple of sandwich shops just round the corner. 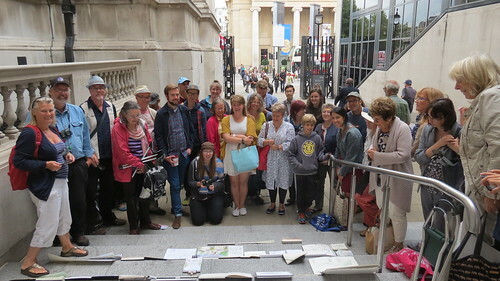 END: 3:30pm - in the walkway between the Sainsbury Wing and main building of the National Gallery (Wet Weather: in the lobby of the Sainsbury Wing) - share our sketches + another group photo to add to the collection! We'll probably try for one with Trafalgar Square or the National Gallery in the background. 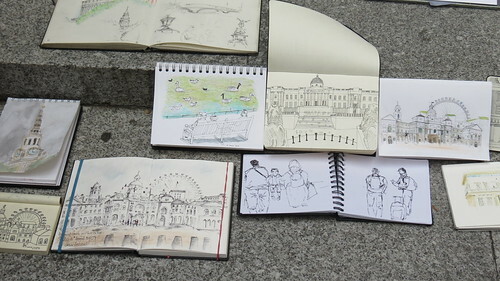 Tweet your sketches using the hashtag #USKLondon and/or #sketching.